Prenatal Yoga Center | Incontinence, Prolapse, and the Core, Oh My! A Discussion of These Common Issues. 11 Apr Incontinence, Prolapse, and the Core, Oh My! A Discussion of These Common Issues. We all know about the common physical issues of pregnancy and postpartum, an achy back, sore shoulders and tight hips. But what about the other issues that are often kept quiet, hidden in confusion and shame. Incontinence, pelvic organ prolapse, finding some sense of connection to the postpartum core! These are huge physical barriers that can have an effect on the quality of one’s life. And while they are common, they are not a “normal” part of pregnancy and postpartum. And the individual suffering through these problems deserves an explanation help. 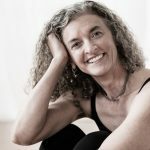 In this episode of Yoga | Birth | Babies, I speak with Registered Pelvic Health and Orthopaedic Physiotherapist, Anita Lambert. She dispels some common misconceptions about the popular “kegel” exercise and thoughtfully explains many pelvic floor and core problems pregnant and postpartum people regularly experience. Whether you are a pregnant person, new parent or birth worker, you will walk away from this episode with empowering and digestible information. Let’s talk incontinence! 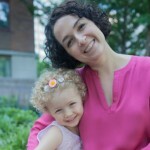 Unfortunately many new mothers experience incontinence and consider it just the “new normal”. Anita explains why why this is common, why it shouldn’t just be accepted, and what people can do about it. Prolapse! What pelvic organ prolapse is and how common it is. How someone may determine they have prolapsed organs. Some therapies Anita uses to help someone recover from pelvic organ prolapses. The postpartum core! I often have students come in and explain that they just feel little connection to the pelvic floor and abs. Some ways to reconnect to your core. 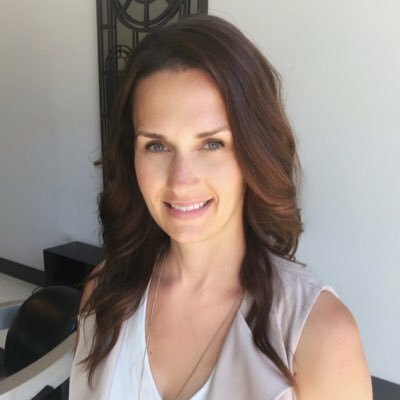 Anita Lambert is a Registered Pelvic Health and Orthopaedic Physiotherapist with a focus on women’s health, specifically prenatal and postpartum care. 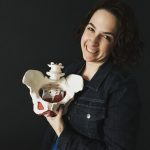 She’s one of the select few physiotherapists in Canada to receive advanced training in labour support, which blends orthopaedic physiotherapy expertise with birth doula support. Anita owns Holistic Health Physiotherapy, where the focus is guiding women to prevent and heal physical symptoms that are common but shouldn’t be considered their ‘new normal’ during pregnancy or postpartum stages of life. Anita is always looking to share and learn up-to-date information about pregnancy, birth and beyond which led her to co host the To Birth & Beyond Podcast. Growing up as a dancer and athlete – you can usually find Anita on the move – whether playing with her kids or exercising with strength training, spin, yoga or Pilates. Anita lives in Peterborough, Ontario, Canada with her husband Andy, daughter Pippa and newest addition to the family – baby Jack.